The outfield position isn’t as deep as I once remembered as it gets thin pretty quickly. This is especially true if you play with four or five outfield spots, which most leagues seem to employ these days. You can really get yourself in trouble if you leave your draft without two or three top 30 outfielders. If you play with five OF spots you’ll want to grab a couple early. There are still plenty of outfield sleepers, and a few listed below. As I’ve preached in these articles, sleeper doesn’t necessarily mean a breakout season is coming. It could be as simple as taking advantage of what the draft gives you. Below are a few fantasy baseball outfield sleepers. Some are primed to take the first step, while others still have something left to offer. Nomar Mazara has hit 20 home runs in each of his three seasons in the Majors. An injury limited him to a career-low 128 games and 536 plate appearances in 2018. Otherwise, he would have had a career high in home runs and runs scored. Mazara drove in 101 runs two seasons ago and he came around to score 64 times. In 2018, the Rangers’ outfielder had 77 RBI and scored 61 times. He had a career high .ISO (178) and hard-hit rate (37.5). The lineup in Texas is still strong and the ballpark is one of the best in the game for hitters. The struggles against left-handed pitching are real, but it won’t keep him off the field. We can just hope it improves as he matures. Sometimes I forget, he’s just 23 years old. I know Fantrax is telling me Ian Desmond’s ADP is 148, but I don’t believe it. This number will continue to fall as we get closer to the season. People don’t seem to care about Desmond after last season’s poor average. I’ve already took part in a few drafts and he hasn’t gone earlier than the 14th round. Even as I write this, I’m involved in a best ball draft at Fantrax and we’re into the 15th round and Desmond is still on the board. Best ball is a bit different and he shouldn’t be your target in drafts, but take him if he’s going to fall that far. After all, Desmond does play half his games in Colorado. His .236 average last season was just the second time he’s hit below .253 over his 10 seasons. Desmond is a career .264 hitter and that’s the number he’ll rebound to. Even with the struggles at the plate, he smashed 22 home runs and stole 20 bags. Steamer projects him to fall short of 20 homers and 20 stolen bases this season, but they also have him for 112 games and 461 plate appearances. That’s just too low of a number, even with with David Dahl, Ryan McMahon and Garrett Hampson in the picture. Desmond has hit at least 19 home runs in six of his past seven seasons and he’s averaged 19.6 stolen bases over his last nine seasons. 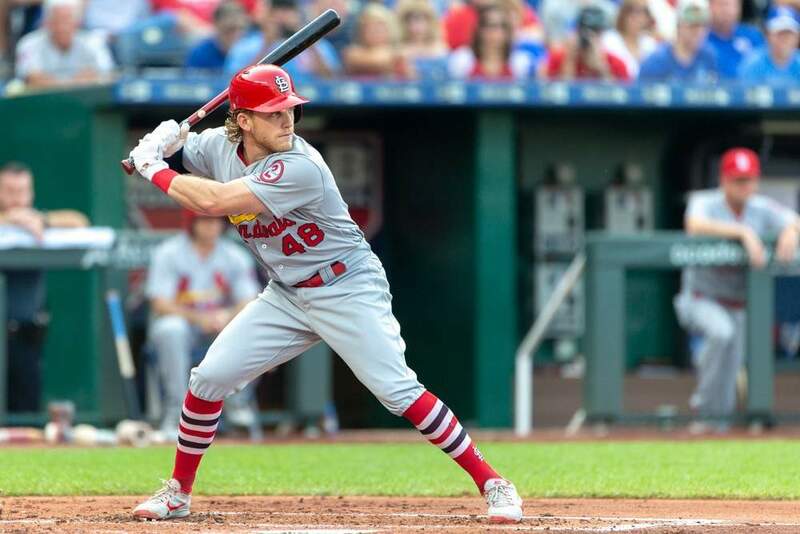 It was a small sample size, but it was a good one and it earned Harrison Bader an everyday job in St. Louis come 2019. Bader struck out 29 percent of the time last season, but his defense and speed will keep him in the lineup. The 24-year-old slugged 39 home runs and swiped 28 bags across AA & AAA in 2016 and 2017. He carried that over to the Majors in 2017, by hitting 12 home runs with 15 stolen bases over 427 career plate appearances. There’s absolutely no question that Hunter Renfroe is a very powerful hitter. He got a taste of the Majors in 2016 (4 HR in 36 PA) after hitting 50 combined home runs in 2015 and 16 across AA & AAA. PCL, yes…but it carried over as he’s hit 26 home runs in each of his two full seasons with the San Diego Padres. I say full seasons, but he only had 479 PAs in 2017 and 441 in 2018. The average has been poor, the strikeout rate is high and he’s been hurt. That said, Renfroe cut his K-Rate down from 29 percent to 24 and his walk rate increased. Look, the Padres’ outfielder crushed baseballs last season: .256 ISO & 47.2 hard hit rate. He also has a career 44.1 fly ball rate which is good for his spacious ball park. It hasn’t slowed him down, though as his .245 ISO since the start of 2017 ranks 20th among hitters with 800 plate appearances. His 44.1 fly ball rate ranks 24th. If he can stay healthy, he’ll flirt with 30-35 dingers, which makes up for the average. This is weird for me as I’m used to projecting Ryan Braun to be a fantasy bust. Mostly because he doesn’t have the best track record when it comes to staying healthy. Braun has been held to fewer than 450 plate appearances in back-to-back seasons and he hasn’t played more than 140 games since 2012. He’s also coming off a career-worst .254 average and .313 on base percentage. So why Ryan Braun? Well, for the first time you don’t have to pay anything for his services and the community is out on him so he’ll be real cheap. If he starts slow and continues to struggle, or suffers an injury then you can just move on. Braun, however, hit .281 in the second half of the season and he finished 2018 with a 43 percent hard-hit rate – his highest since his rookie season. He also hit 20 home runs and stole 11 bases. At age 35, the decline has begun, but it’s worth finding out how much he has left. This Brewers lineup powerful and their hitter-friendly ballpark contribute to that. Stay away from him in weekly lock lineups and if it’s going to be a head-to-head league, make sure it’s a daily one.